As students move into freshman residence halls like Potomac House, they may encounter difficult roommates. 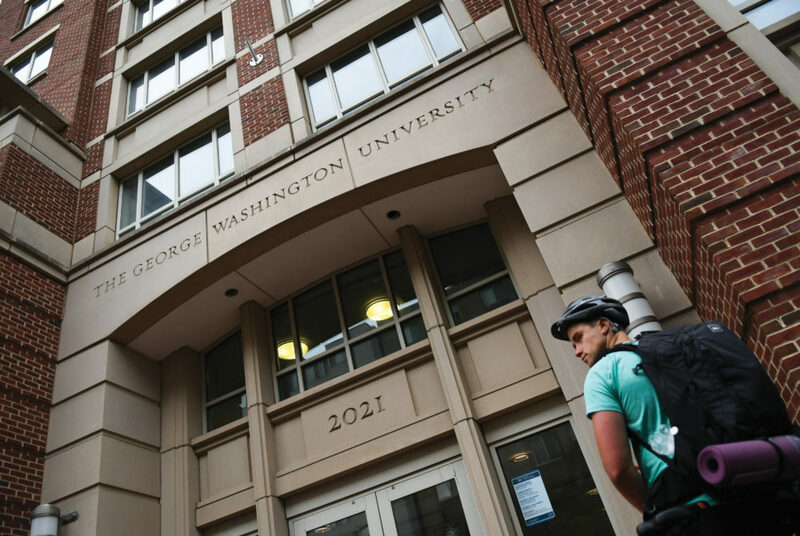 Whether you’ve secured the ideal roommate through Facebook or you just received a random match from GW Housing, you won’t really know what kind of person you’ll share your room with until the semester is up and running. While you should try your best to get along, it can be hard when your small residence hall space is filled with different types of people. Imagine waking up for class with your roommate awake in bed watching Netflix. When you get back from class, your roommate is still in the room, only now they’re heating up popcorn and want to hash out their day’s schedule. Then after your jog around the National Mall, you come home to the same roommate taking a nap. If you’re annoyed by the lack of alone time, try covering your ears with some noise-canceling headphones and zone out. When your chatty roommate realizes you don’t want to talk, they’ll most likely keep to themselves. If not, get ready to hunt for some quiet hubs to study alone at or recalibrate, like Square 80 or Gelman Library. First impressions made you think your roommate would want to do everything together. But you might wake up on the first day of classes and notice that your roommate is already gone – and you don’t hear from them again until you hear their key rattling at 4 a.m. If you’re nervous about their whereabouts, they could have already immersed themselves into the bustle of campus life. Between class and extracurricular commitments, they probably just can’t make it back. But if their side of the room is becoming an untouched shrine of their belongings, you should probably check in with a quick text. They could use someone to reel them back to the comfort of their bed every so often. If you open the refrigerator a day after grocery shopping and find someone has already broken into your peanut butter, you should let it slide the first time – you wouldn’t want to start drama just days after settling in. But if a week later, your roommate stumbles back from a frat party wearing your $50 romper with the tags still attached, it’s time to lay down the law. If a roommate is consistently borrowing your things without asking, you have two options. You could label your items with a sticky note that says your name. But for a less passive-aggressive approach, you should ask during the first few weeks what they’d like to share and what is off limits. Chances are, they’re OK with sharing their belongings if you are. In that case, get excited about an expanded wardrobe and another snack shelf. If your roommate stumbles in from an afternoon darty Saturday, and then an hour later has drunk friends banging on the door urging them to rally for a night out, you can just laugh it off. But it’s all fun and games until they throw up on the floor at 2 a.m.
You may have thought your roommate wanted to get out some partying impulses during the first light week of classes, but their play-hard tendencies could transcend into every weekend. If it bothers you to hold their hair back every Friday night and you’re worried about their excessive partying, address the problem head on and tell them about your concern. It could be a wake up call. If this behavior continues or gets out of hand, don’t hesitate to call EMeRG – you could teach them a much needed lesson about alcohol poisoning if they’re getting out of hand. If your roommate is an avid Tinder user, came to college with a preexisting relationship or just finds someone to hook up with at every party – you’re bound to be sexiled. When you just want to relax in bed wearing a face mask and eating a pint of ice cream, the last thing you want to hear is your roommate asking you to leave for an undefined time period while they hang out with a potential partner. If you’re tired of leaving when they ask you to, inform your roommate of days and times in your schedule that you’ll be gone so they can schedule around you instead of the other way around. In the future, instead of scurrying away to a friend’s place nearby, try hosting some friends in your room for a gathering before your roommate makes it back. If your roommate wanders in and realizes they’ll have to kick out more people than just you, they’ll probably head to the other person’s place.